Hi Angie! I'm back with another candy creation. I made this boy birthday card for my nephew who's turning 9 on Saturday. I have 9 nephews and they're all anxious to receive a candy card for their birthday. EXTRA! EXTRA! Read all about it! It's Marco's birthday today! I'm not playing TWIX on you but I bought you a MACKINTOSH'S (black out the s) computer for your birthday but it slipped from my BUTTERFINGERs and it broke to PIECES. Then I went to the bank and asked for a $250,000 loan so I could send you shopping but MR. BIG said I was an AIRHEAD for even asking. So, since my account is ZERO, all I can give you is this card. From a few of your NERD y relatives, we'd like to WISH you a HAPPY BIRTHDAY! Great to see you again! You are so clever. I love the ideas you come up with for your candy bar cards. It's no wonder your nephews are all eager for their birthdays to roll around when they have something so fun to look forward to. I think this is such a great idea for you to start as a family tradition. It's so inexpensive, but so memorable and people could really take a lesson from you and incorporate these clever gift cards into their own relationships. 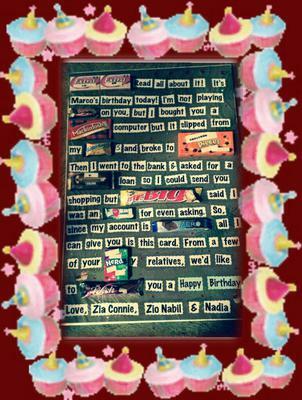 I bet all of your nephews will look back with fond memories of Zia Connie and the candy cards she used to make for their birthdays. A real treasure for them to remember! Thanks again for taking the time to share this boy birthday card creation with us. Do keep them coming. With Christmas just around the corner, be sure to send us photos and idea of any goodies you make throughout the season.